At Beach Air, we offer the Nexia™ system and compatible products installed by a highly trained professional who will work with you every step of the way in choosing the system that’s right for you – from walking you through the entire purchasing process to conducting an in-depth analysis of your home and your comfort needs. Based on that information, your dealer will recommend a system that works best for your home. After all, the more efficient the system, the more comfortable you’ll be. 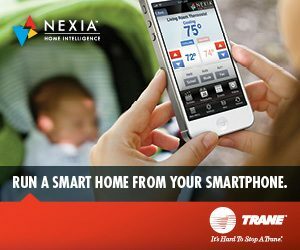 • Home Bridge System – Connects to your router and all of the Nexia™ enabled Z-wave devices throughout your home. Allows you to control your home from your smartphone, tablet, computer. Add compatible products to the Bridge to expand your home automation system anytime. • Nexia™ Certified Z-Wave Locks & Accessories – Delivers highest level of durability and security for residential door locks, as certified by BHMA, anti-pick shield protects against lock tampering, auto-lock feature automatically relocks door anytime it’s left unlocked, assign up to 30 personalized 4-digit codes, built-in alarm technology alerts homeowners to potential security threats, designed for strength and durability, tested beyond 250,000 uses, guaranteed to fit existing pre-drilled standard doors. • Nexia™ Wireless Cameras – Remotely view what is happening inside and outside of your home. Motion activated recording available. • ZW+ Smart Energy Switch – Control small appliance and plug in incandescent fluorescent, and LED lighting. • Doorbell Dome Multi-Chime Siren – Know when a door opens, someone pulls into the driveway, or if there is a break-in, using a single siren. • Motion Sensor – Remotely monitor home’s activity and movement. Receive alerts when activity is detected. • Fibaro™ Multi-Sensor – Detects motion and changes in light and temperature and sends an alert to the Nexia™ web portal and mobile app. • GE Fan Control Switch – Turn ceiling fans on and off and controls up to three speeds remotely from the Nexia™ mobile app or web portal. • Nexia™ One Touch – Controls smart products with the touch of a button. Using the Nexia™ portal or app, assign any mode or automation to one of the 15 presets. Nexia One Touch operates stand alone, no phone or computer required. • Light Dimmer & Appliance Modules – Control/dim plug-in incandescent, flourescent, LED lighting, and small appliances. • First Alert® 2-in-1 Smoke & Carbon Monoxide Alarm – Helps ensure that your home and family are protected from fire, smoke and carbon monoxide even when you’re not there. • Door/Window Sensor – Remote monitoring of doors and windows within your home. • Linear® LED Light Bulb – Turn on, off, and dim the LED bulb via the Nexia web portal and mobile app. Serves as a Z-Wave range extender. • Nexia™ Doorbell Sensor – Detects and alerts when doorbell button is pressed. • Go Control™ Garage Door Controller – Open, close and monitor the status and receive alerts about your garage door from anywhere with the Nexia™ app. Serves as a Z-Wave range extender. • GE Outdoor Module for Lighting Control – Wireless control of on/off functions for incandescent and fluorescent outdoor lighting. What you need to get started with Nexia™ – Active broadband internet connection – Thermostat with Built-in Nexia Bridge or a stand-alone Bridge – Sufficient Wi-Fi signal strength at the Control mounting location – A valid e-mail address – For mobility accessibility, an iOS or Android smartphone or tablet with internet access. What sets Nexia™ apart? No fixed term contracts or cancellation fees. Compatible with over 500 other connected devices. Open architecture supporting connected devices from many manufacturers. U.S. based call center for live customer support 7 days a week. Your privacy is assured; Nexia™will never sell your data. Subscriber welcome program for on boarding. Best-In-Class-Setup and Installation Wizards for consumers. Beach Air is a Certified Trane® and Nexia™ dealer – Call us today at 843-796-3798 for a free onsite estimate for a new HVAC install or to ask about the Nexia™ line of products.